Marion E. Morris, age 86, of Hampton went home to be with the Lord on January 23, 2019 from the Life Care Center of Elizabethton. Marion was born in Elizabethton, Tennessee to the late William Thomas and Margaret Little Morris. 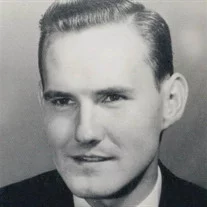 In addition to his parents, he was preceded in death by two brothers, Bill Morris and Eddie Morris, both of Maryland; one sister, Janie Rinker; a half-brother, Jerry Walker; and three half-sisters, Betty, Lucy and Mary Alice. Marion was a strong family man, loving, very faithful, kind and gentle, who loved his wife and son and loved his Lord. He was a United States Army veteran, having served in the Korean Conflict. Marion was a faithful member of Sims Hill Christian Church and was a graduate of Hampton High School. He retired from Snap-On-Tools and had also worked at American Air Filter and North American Rayon Corporation. He loved fixing things, loved God, family and his country. Those left to cherish his memory include his loving and devoted wife of 66 years, Christine Morris, of Hampton; his son, Chris Morris, of Elizabethton; and a special nephew, David Walker, of Maryland. A service to honor and celebrate the life of Marion E. Morris will be conducted at 7:00 PM on Friday, January 25, 2019 in the Chapel of Peace at Tetrick Funeral Home, Elizabethton with Mr. Bret Jones, officiating. Music will be under the direction of Lauren and Lynette Poe. The family will receive friends from 6:00 PM until 7:00 PM in the funeral home chapel, prior to the service on Friday. The graveside service will be conducted at 11:00 AM on Saturday, January 26, 2019 at Happy Valley Memorial Park. Active pallbearers will be Bill Trivette, E.J. Blevins, Laverne Banner, Jeff Neubert, Mack Henry, Ken Guy and Ted Vines. Honorary pallbearers will be the men of Sims Hill Christian Church. Those wishing to attend the graveside service are asked to meet at Tetrick Funeral Home, Elizabethton at 10:30 AM on Saturday, to go in procession. The family would like to thank their Sims Hill Christian Church family and Hampton Christian Church, Dwayne Calhoun, and the loving staff at Life Care Center of Elizabethton. Those who prefer memorials in lieu of flowers, may make donations to Sims Hill Christian Church, 206 Sims Hill Road, Elizabethton, TN 37643. Mr. Morris and his family are in the care of Tetrick Funeral Home, Elizabethton. Office 423-542-2232, service information line, 423-543-4917.